Restoring red leather on red/gilt HMV 101...shoe polish? Post subject: Restoring red leather on red/gilt HMV 101...shoe polish? I have a nice HMV 101G portable, code RL101G...the deluxe model with red leather covering and gold plated hardware. The exterior leather is faded and stained and scuffed, and although I like patina, it's a tiny bit too rough and uneven and pink for my tastes. And the interior does not match the exterior, of course, either. I'd like to do a bit of evening-out. I saw a reference to using shoe polish on the leather, and that seems like it might be an easy fix, but before trying that I thought I might ask whether anyone has experience with that. And if it works, what is the best shade of polish to use? I guess I'd apply it to all leather surfaces inside and out, for consistency. Alternatively there might be some sort of leather treatment that will darken and bring the color back, but I'm in the woods on that sort of thing. Or maybe there is something else altogether. So what can you suggest, please? Post subject: Re: Restoring red leather on red/gilt HMV 101...shoe polish? I haven't tried it with a portable, but I did use shoe polish to bring an original Zonophone carrying case back to life. Very easy and very effective, and it still retains enough wear and patina to show its age. The red leather used on De Luxe versions of the HMV101 and 102 portables is wafer thin and easily damaged. The red leathercloth case covering is more durable. I own HMV102 examples of both the red finishes. On the De Luxe model the leather was worn and faded, but red shoe cream greatly improved it. Being of a softer consistency than regular shoe polish, it is easier to apply and goes on more evenly. I did not touch the interior, which was in excellent original condition with almost no wear on the gold plated components. 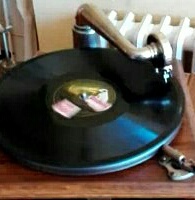 Launched in the teeth of the depression, the red leather HMV102 was expensive and did not sell well. It was discontinued in the mid 1930's and is rarely found today. Thanks very much - I think I'll gently try shoe cream. Do you by any chance have a shade by a specific maker that you have found to be the best match? It's certainly not scarlet, may be red, but also could be in the burgundy direction. Luckily I see a wide range of choices, some by European makers, on Amazon. Try to find a car leather upholstery restorer around you. They use products that are incredibly good and not avaulable on stores. They might be willing to try on something different for very little money or even give you some samples of their products and some guidance on how to use them. On black leatherette machines 101 & 102 I've been using currently black shoe cream with success. On another brown crocodile leatherette 101 I used brown shoe cream once. Other times I've used incolore furniture wax. Never had problems with these products... Perhaps wax produces a more impervious finish, and a certain shine. Do you recall which shade of red you used from that company? It was some years ago and I used Signal Red, which is no longer listed on the website. I would suggest taking screen prints of the three shades of red on the website, and selecting the nearest match to the interior of your machine. Leather being a natural product, shades will vary from one machine to another. As always with coloured finishes, start with a small inconspicuous area of the case covering before committing yourself. Great, thanks. I'll grab a few likely candidates and do tests...the stuff is cheap. Thanks to all who gave suggestions! I'll post before and after pix when done.